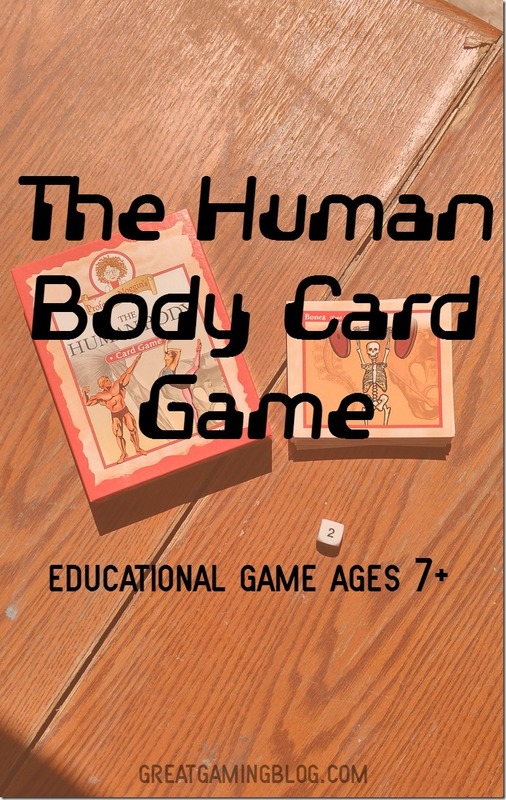 Professor Noggin’s The Human Body Card Game (Outset Media) is for ages 7 and up and is a fun way to learn body facts. 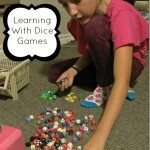 This would be an ideal game for homeschoolers but is also just fun for learning anytime. 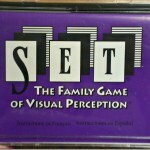 This game is part of the Professor Noggins series of educational games. Gameplay is very simple. First you must decide if you will play EASY or HARD. If you have a mix of ages you can decide that say all adults will do hard and all kids will do easy if you want. Shuffle the cards and place them in a pile in the center of the table. Roll to see who goes first. Player 1 (the one who goes first) rolls the dice and picks up the top card. She flips the card over and read the appropriate question to the player on her right (Player 2). Make sure you read from the right difficulty level. 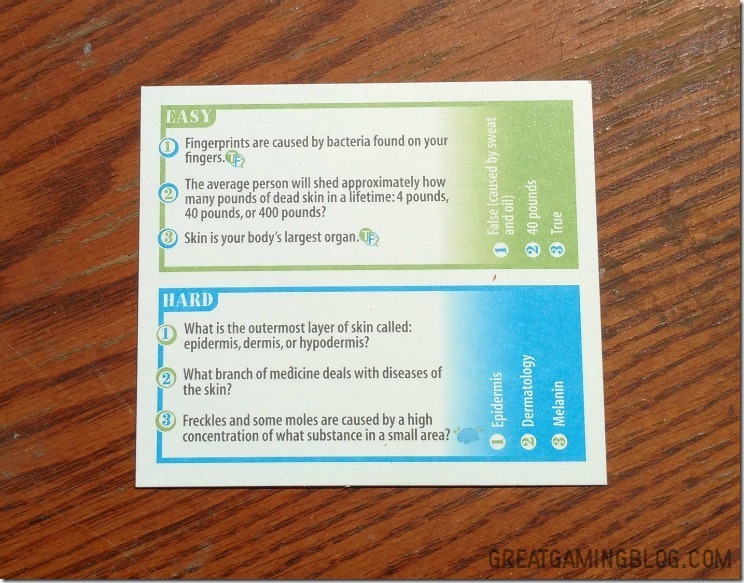 So for example if you had the card below and rolled a 2 you would read #2 from the right difficulty level. Let’s say everyone is playing easy. So you would read Easy #2. The player on the right has one chance to answer it correctly (answers are on the right.) If they answer correctly they keep the card. If the answer is wrong then Player 1 reads the correct answer out and puts the card at the bottom of the pile. Play moves to the right (counter clockwise). 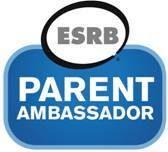 So player 2 would be reading their question to Player 3 this time. If it’s marked with a TF (see #1 and #3 on Easy below) then the question is True or False. They keep the card if they guess correctly. Play continues until ALL cards are gone. Player with the most cards wins. 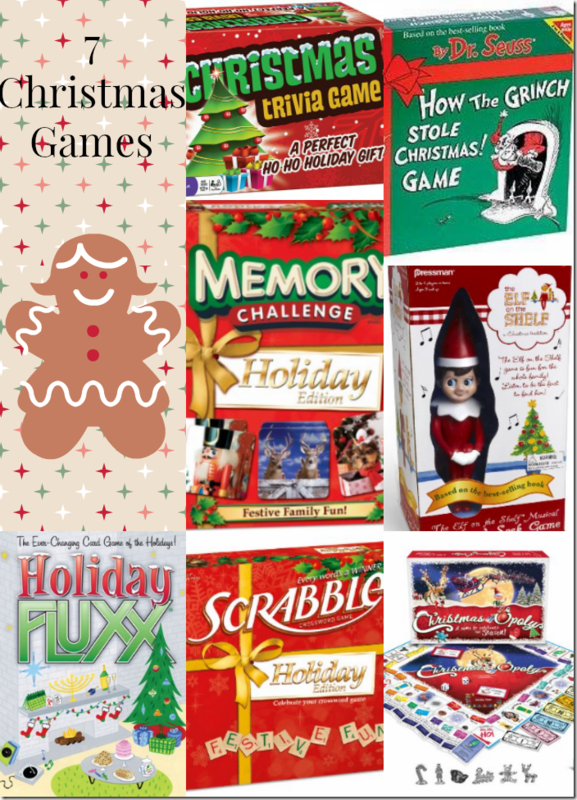 Below is shown just a sample of some of the card topics. 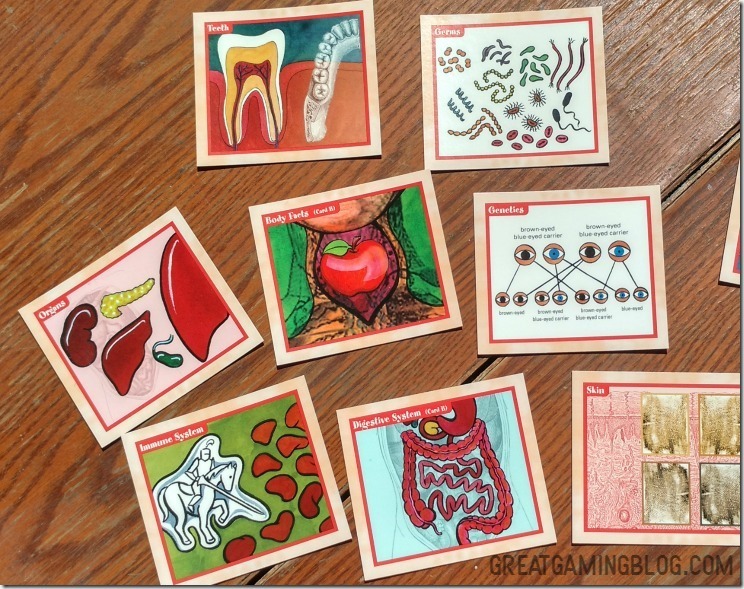 They are all related to the human body in some way. Besides the icon that shows a question is True or False there are two more options that might show up. A face – Noggin’s Choice – if you get this one you do NOT read a question but you get to choose a card from any player and add it to your winnings pile. The Noggin’s Choice card is then returned to the bottom of the main pile.